Dr. Michael E. Mann recounts a story in his recent book (the Hockey Stick and the Climate Wars) about an encounter with Hillary Clinton during a hostile congressional hearing. While he was fending off hostile questions from senators like Senator James Inhofe (who described climate change as "the single greatest hoax ever perpetuated on the American public") Hillary Clinton asked a (friendly) question along the lines of "what was the world like the last time carbon dioxide levels were this high?" (the story is on pages 119-120 of the hardback version of Mann's book). We have to go back to the time of the dinosaurs probably to find CO2 levels that we know were significantly higher than the CO2 levels today. This struck me as being something of a spur of the moment exaggeration (I still remember some of my training in geology), a view at least supported by the Wikipedia summary. Mann neither gives a source nor a comment on his response. So my question is: has current thinking about historic CO2 levels changed? Do we have more CO2 than at any time since the Cretaceous when dinosaurs still roamed the earth? Or was Mann just using hyperbole for effect? NB: This isn't a question about the effects of CO2 or about the broader issues of climate change. It is just about the specific topic of the history of the atmospheric level of CO2. It's very hard to be definite, because the error-bars on the estimates become large, as we look back in time. However, as the first graph below, which aggregates the results of several studies, shows, the last time it was significantly higher what it is today, was around the Cretaceous period, denoted by K.
As far as we can tell, current levels are higher than they've been for 15 million years. Now "significantly higher" isn't very specific. Current levels are around 390ppm, up from around 280ppm before the industrial age started. So what's significantly higher? Let's say 800-1000ppm would be significantly higher (2-2.5 times current levels), and as far as we can tell, the last time atmospheric CO2 concentrations were that high, was indeed the Cretaceous period (which ended 65 million years ago). (note that the present day is on the left in this graph). According to Coupling of CO2 and Ice Sheet Stability Over Major Climate Transitions of the Last 20 Million Years Science 4 December 2009: Vol. 326, pp. 1394-1397, looking especially at Fig. 2, 15 million years ago CO2 levels were 430 ppm, which is 8% higher than currently (2016). The highest estimates of pCO2 occur during the Mid-Miocene Climatic Optimum (MMCO), ~16 to 14 Ma, the only interval in our record with levels higher than the 2009 value of 387 ppmv. Where "Ma" means million years. 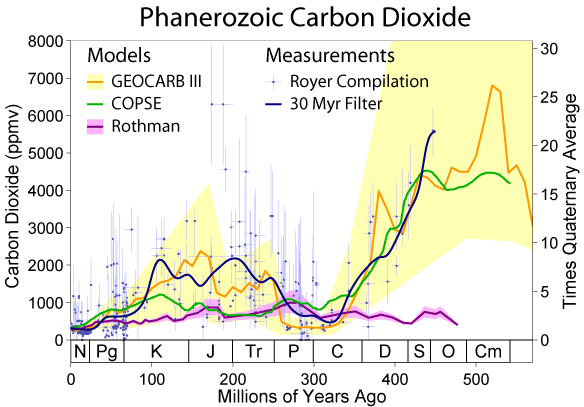 Additionally, Atmospheric carbon dioxide concentrations over the past 60 million years Nature 406, pp. 695-699 shows CO2 levels of 1000ppm 40 million years ago, 2500ppm 46 million years ago, and consistently above 1800 ppm in the 52-60 million year time period. So, no, the Cretaceous period was not the last time, significantly higher than (more than double) present CO2 levels occurred more recently in the Paleogene period and somewhat higher levels occurred during the Neogene period. So Dr. Mann let me ask you, what was the Earth’s climate like the last time that there was atmospheric concentration of carbon dioxide at today’s levels of 370 parts per million? Dr. MANN. Thank you, Senator, that is an excellent question. We have to go back fairly far into the past to find CO2 levels approaching the CO2 levels today. Ice core studies that have been done over the past decade or so have told us that today’s CO2 level is unprecedented now in at least four glacial or inter-glacial cycles. That is more than 400,000 years. In fact, now as we look back from other evidence that is a bit more tentative, it appears that modern CO2 levels probably have not been observed in 10 million to 20 million years. So we have to go back to the time of the dinosaurs, probably, to find CO2 levels that we know were significantly higher than CO2 levels today. Not the answer you're looking for? Browse other questions tagged climate-change geology .